Adventures In Creating: Coffee Table Part 5: Table Tops! After the frames were all welded and painted the last step was making the wooden tops. My original inspiration tables are made of old railroad ties, so I wanted the tops to have a stained and aged wood look. I debated on buying old wood planks or buying new and making them look old. In the end it was easier and less expensive to buy the wood new, so I went over to my local Home Depot and took a look around. I decided to splurge and buy the nicer grade pine since I was staining it. Helpful Hint- always pull out the boards your going to buy and look them over. Make sure they are not warped or are damaged. And keep in mind that wood is labeled in "nominal" inches (ex- an 1" x 8" wide board) but is cut in actual inches (a board labeled 1" x 8" is actually 3/4" x 7 1/4"). I wanted the tops to be extra sturdy so I needed to join the board together end to end. Unfortunately I don't have a Kreg Jig (like the fabulous Anna White) or a biscuit joiner, so I settled for the next best thing, Liquid Nails that I had left over from my bathroom remodel! I ran a bead down the the ends of the center board, then laid them on top of the table and made sure they were all in line and even. Then clamped them tightly together and weighed the whole thing down with heavy books; this way the boards wouldn't bow up. I left it like that over night. In the morning, even though I had wiped off the excess Liquid Nails some of it still seeped through. So I tried scraping and sanding it off- it was a pain! Lesson learned: keep an eye on your project at all times! After I was through with that I went onto the next step of making my extra sturdy wood tops. 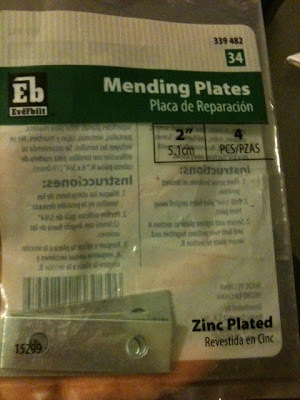 I used something called a mending plate on the underneath of the table top to further help join the wood together. 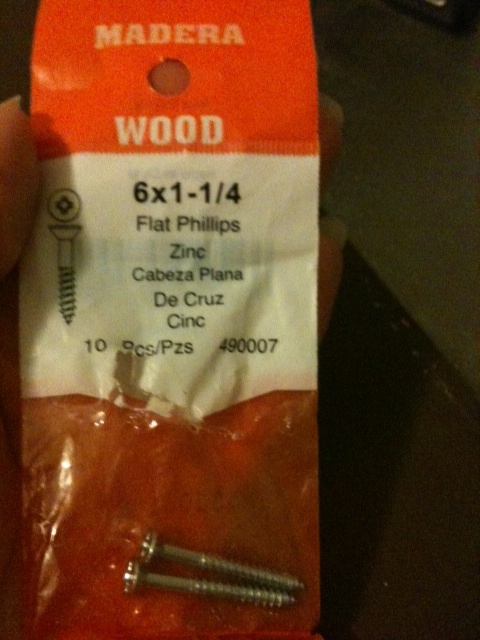 I marked where I needed to put the screws then predrilled the holes so as to not split the wood. Then screwed them all on. I used 8 evenly spaced for the large table top and 4 for the small one. I choose to adhere the tops to the frames before I stained them, I'm sure you could go either way this just seemed easier to me. 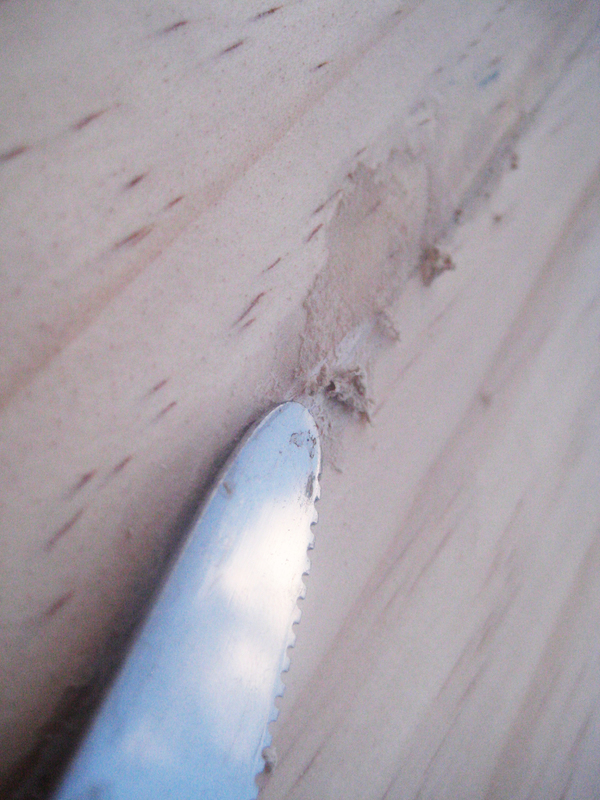 I used the metal drill bit on my drill and drilled several holes on each of the table frames. Then using 6x 1 1/4" wood screws I attached the tops to the frames. I gave the tops a final fine grit sanding and then cleaned them off really well with a cheese cloth. Then it was time for the staining! I haven't stained a lot of wood before, I usually just paint it. So I wanted to make sure I knew what I was doing. I choose to use a Purdy Paint brush specially made for stain and choose a Minwax Stain in Dark Walnut. I made sure to paint in the direction of the wood grain and did a small section at a time, wiping off any excess as I went along with a paper towel. I let the first coat dry completely overnight before applying a second coat. Once all my stain coats were done and dry I sealed it with a rub in sealer also from Minwax. I bought the satin sheen because I didn't want it to be all shiny and new looking, I liked the natural look of the wood. 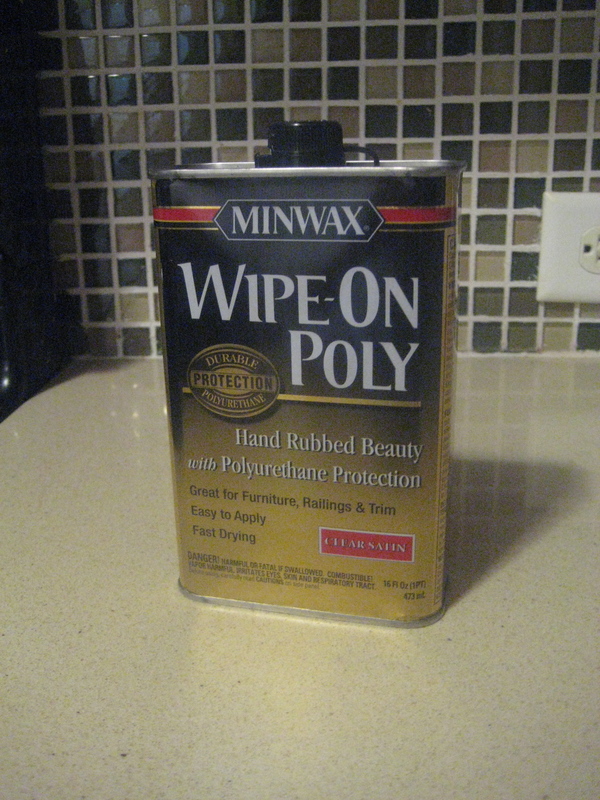 I did 3 coats of this since I have a feeling the tops are going to receive a lot of abuse. I used the rub on kind because I didn't want to risk leaving brush marks on the wood. It goes on easily, I just wiped it on with a soft rag. And then all done!! 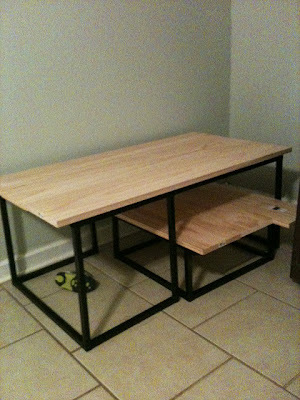 Overall the cost was about $100 for the steel, stain grade wood, and supplies. Not bad considering I had originally seen them selling at Anthroplogie and Viva Terra for $399-$599 respectively. Boo Ya! I just want to say that if you really want something, and you put your mind to it you really can accomplish what you want. These tables are truly a testament to that! If there's something your not sure of how to do do research! Look online, ask the guys at Home Depot, ask a friend or neighbor if they have any insight. That's a big part of how these tables came to be! This is awesome! I have been wanting to do exactly the same thing for our basement!!! Thanks for the inspiration. I'm going to show this to my husband (he loves to weld :) ) so hopefully I can get him going on that part! truly amazing. Hard work pays off! Very nice job. Excellent instructions. Amazing work! I am very impressed...and jealous! Woow! Awesome! I recently saw a set of 3 at a thrift store..$15 for all three! (the large one was 1/2 the size of yours) Didn't get it because we have toooooooo many tables in this house, but I love stacking tables! They are awesome!! Wow, just found your blog researching for a table refinishing project--of all of the crafts and creativity blogs, yours is so much more closely aligned with my own projects. I love it!!! 1. In staining--what did you do to get such an "inconsistent" look? I too, want my table top to look old/vintage. 2. What did you actually do to add your "vintage wood style details"...I cannot tell from you closeups. 3. 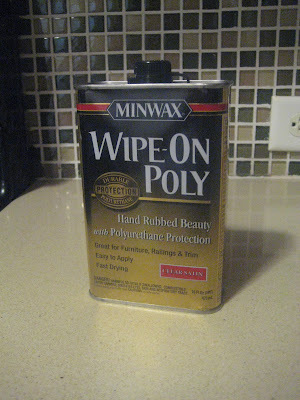 I've never used the Wipe-on Poly (I hate regular poly)...does it still give you that hard clear finish kind of like a clear coat for your fingernails OR does it look in the end more like a rubbed on penetrating oil finish? I want the look of using a tung oil (or similar) but it is a kitchen table so it will likely get a lot of abuse too. Are you serious!?! 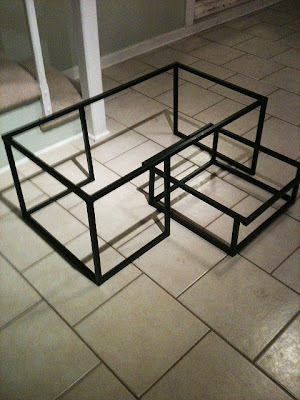 These tables are so amazing! You are an inspiration!! !